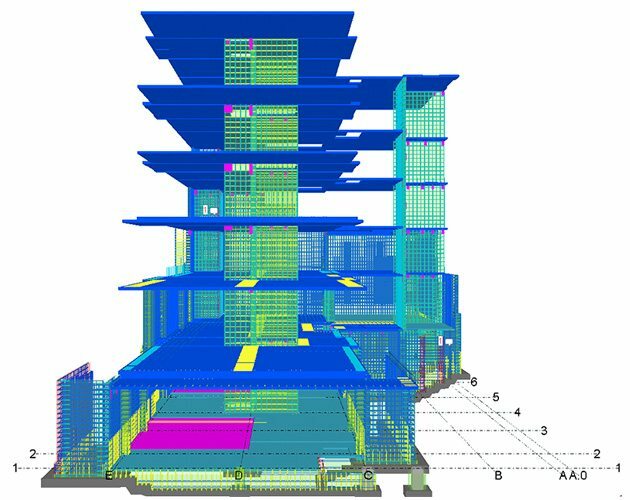 BIM is a process used by designers, contractors and owners to build and manage a project virtually. This process opens the lines of communication, enhances collaboration, and allows stakeholders to visualize every detail of a project in 3D. Advanced models are taken to 5D with the addition of time and cost information. The days when all you needed to build with concrete were a backhoe and a truck are long gone. Complex designs, tight schedules, and a short supply of skilled labor all mean that in order to excel, innovation in every process must be a top priority. 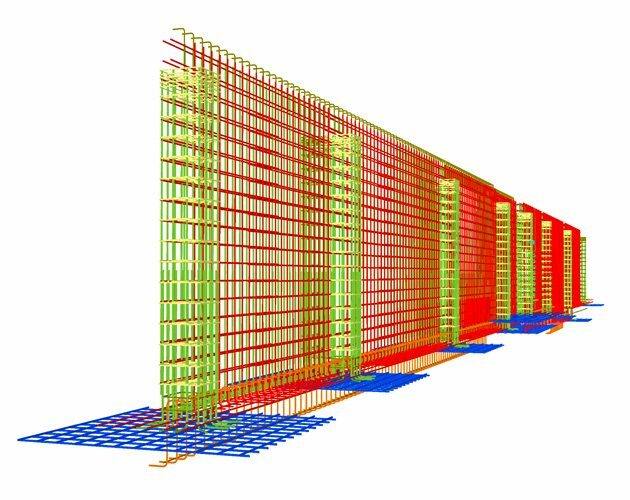 Wayne Brothers leverages virtual design to estimate concrete quantities, design and prefabricate formwork, and verify constructability. Every part of the concrete scope is modeled completely and accurately. This process allows us to carefully plan each pour well in advance of the project start. The result is less wasted time, material, and no more last minute decisions. Wayne Brothers models rebar to help predict conflicts and congestion issues and resolve problems before they happen. That is because in our models, every bar is detailed directly into our coordinated concrete model. The rebar model is checked carefully for constructability, and the approved bar list is fabricated directly from the model geometry. When it comes time to install the rebar, our crews utilize the model to plan installation in a safe and efficient manner. At Wayne Brothers, we create models for each stage of work within the civil and infrastructure realm. The work is then sequenced and coordinated with other trades to mitigate installation issues and to ensure maximum safety and productivity of the crews involved. All existing and future underground utilities and structures are modeled in detail so that the design intent can be checked and verified against real world conditions. 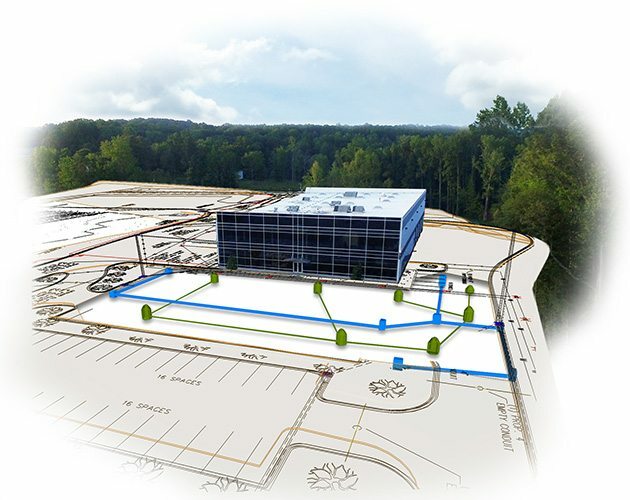 On projects where Wayne Brothers is responsible for the concrete scope of work in addition to civil and infrastructure, the excavations and backfills required to support the concrete scope are also modeled to ensure a seamless workflow from start to finish. 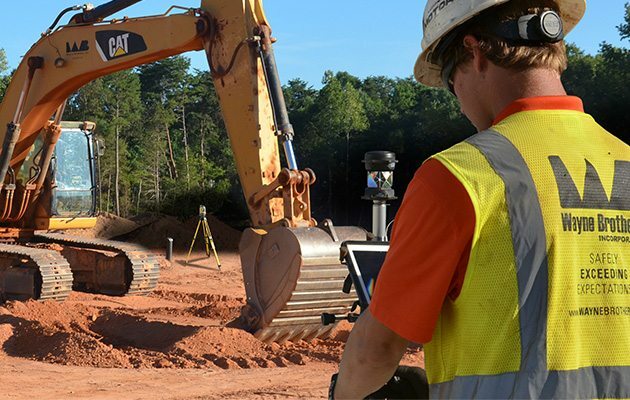 See how Wayne Brothers is using the latest VDC technology to model each stage of the civil and infrastructure process. 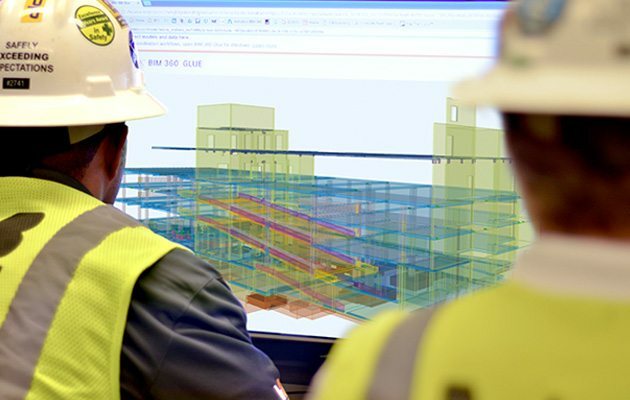 Wayne Brothers is committed to leveraging the power of BIM to it’s fullest capacity on every project. In the case we are the only trade on a project doing so, we work to incorporate all data possible to overlay with our model. 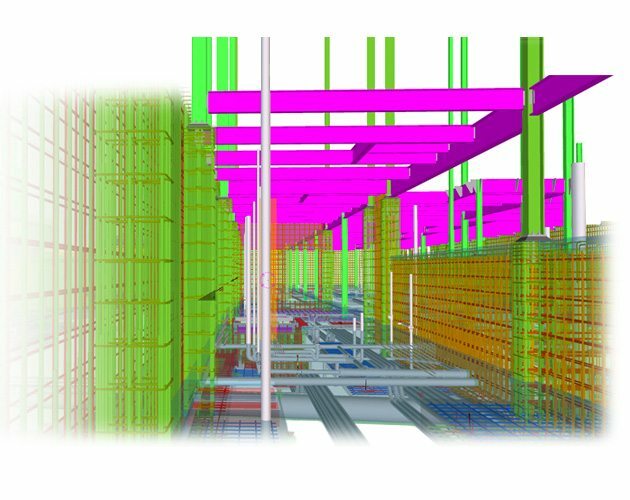 When the project includes a BIM expectation and a fully involved BIM coordination, Wayne Brothers has the capacity to participate fully in the effort. We understand that carefully coordinated, planned and executed projects have a much greater chance of success for all parties involved. The coordinated model becomes a construction management tool when construction begins. Crews track progress in the model, and the data is streamed instantly back to the office. When issues arise in the field, they are recorded and tracked in the model in the same fashion. Task specific QA/QC and safety checklists are integrated into our models and ensure things stay on track. When the design or schedule change, the model is revised and the effects of the change are clear to the entire team. 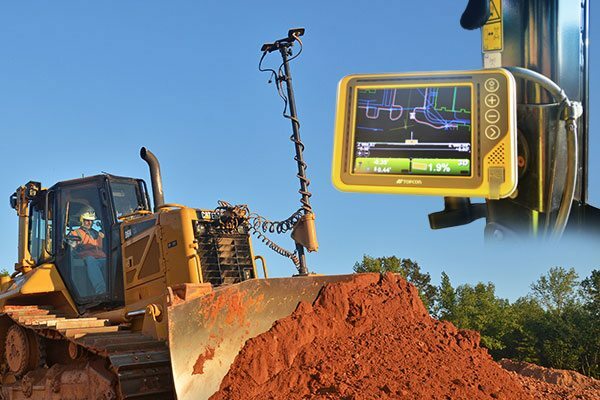 Machine control systems on our heavy equipment enhances operator efficiency and improves accuracy. Grade is controlled by the model, and changes to the design are sent wirelessly from the office to the machine. There is no better way to ensure work is being executed per the current design. As work progresses, as-built data is sent back to the model for production tracking and QA/QC. Layout is performed by our highly skilled Virtual Construction Engineers with the use of robotic total stations. Coordinate points are derived from our coordinated model and transmitted to our team in the field. Layout is verified in real time, because the model is visible on our layout equipment. The result is reduced risk and faster, more accurate layout than what is possible with traditional methods. 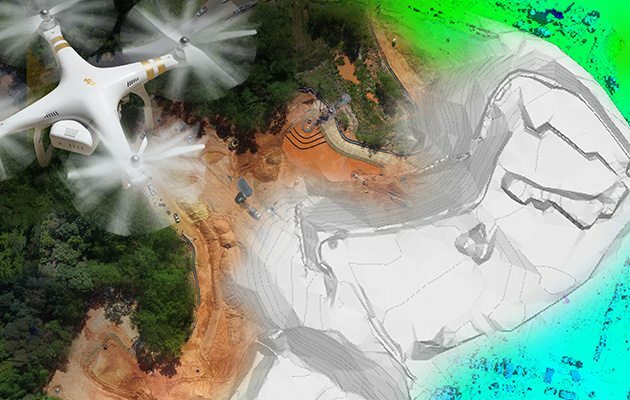 Our Virtual Construction team deploys the use of a drone to quickly and accurately assess the current topography of a site. The use of the drone allows us to collect data in a fraction of the time a traditional site topo survey would require. The data collected is streamed to the office, and current conditions are compared to the design model for a comprehensive look at current progress of the project.